My friend, Kate and her husband Phil, came to visit over the holidays. One of the things Kate wanted was to learn how to make pies. So we made several…one was this Coconut Cream Meringue pie (pictured to the left) and the other was a Chocolate Meringue pie. Not only was it fun to make them but even more FUN to eat! Baking is a luxury that I don’t typically afford myself throughout the year. However, since I was on a roll, I made 2 more Banana Cream pies just to satisfy a personal craving….. and of course, to share with my friends and family! Maybe that’s why I put on 10 pounds over the holidays! LOL! Now, it’s back to the treadmill! Separate 4 eggs. With fork whip egg yolks together. To temper the egg mixture, gradually add 1 cup of custard into the egg yolks. Stir continually so the hot liquid does not cook the eggs. Then add the egg mixture into the sauce pan and return to medium heat. Stir continually another 2 minutes until the egg yolks are cooked. 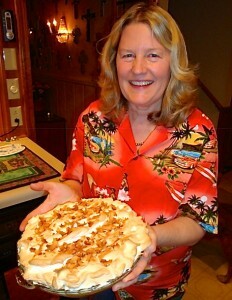 With a large spatula, dollop the meringue on top of pie then gently work it to the edges, completely covering the pie. 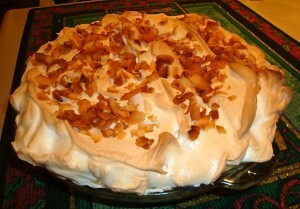 I like to add a few tablespoons of toasted coconut to the top of the meringue before placing it in the oven. Bake at 350 degrees or until the meringue is lightly browned – about 10-12 minutes. (Tips for meringue) Make sure the egg whites are room temperature before whipping them – make sure there is not even a tiny bit of yolk in the egg white – do not over whip the egg whites. When they become stiff, ,add the sugar and blend then stop whipping. I sure picked a bad time to give up carbs. Coconut Cream Pie is my FAVORITE! Is my timing impeccable, or what? I’ll put this recipe away for next summer. Oh sure Tom! I have to do that too! I’m either slimming, coasting or gaining. LOL! This recipe is a good one for when you have achieved your goal and need a reward for all your hard work.